The world software giant, Microsoft has released a beta version of its Phone Data Manager. Microsoft Phone Data Manger Beta is a desktop application that synchronizes contacts, music, pictures and video between your phone and your desktop through the web. 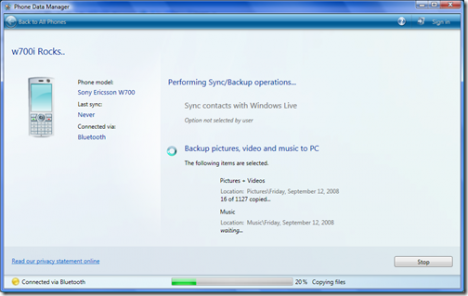 With this application, you can easily backup a copy of the contacts, music, pictures and video from phone to desktop. To use this application, you need a windows live login. Microsoft Phone Data Manager Beta synchronizes the contacts present in your phone with your contact store on windows live contacts and the media is synchronizes with any folder you choose on your desktop. Microsoft Phone Data Manager support communication via USB or Bluetooth. You can download the Microsoft Phone Data Manger Beta from here or check the list of supported phones. Connectivity: Bluetooth or USB data cable that work with phone and computer.